Welcome to my site. Here I have some information on my personal projects. 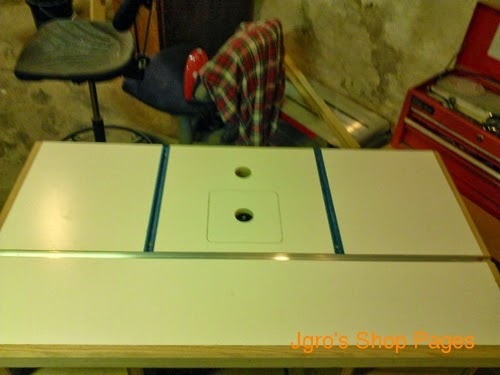 With the sub-surface of the table top screwed on, I started making the final table top. 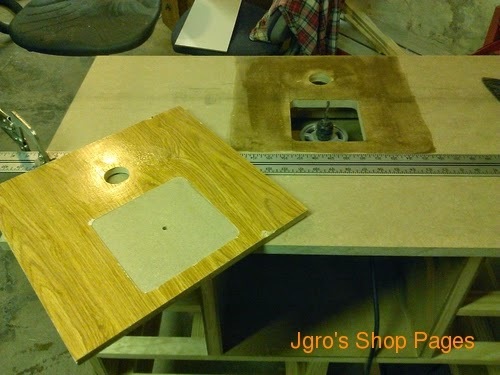 I used a piece of 2' x 4' laminated particle board that is 1/2" thick. 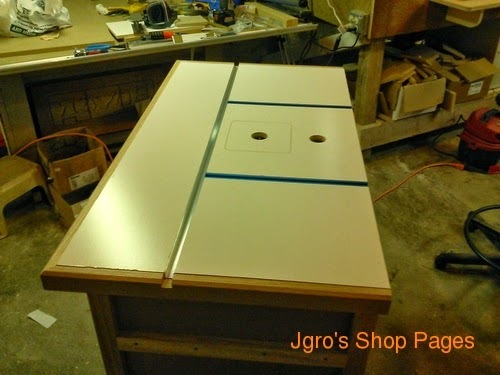 Since the t-tracks and the miter track that I wanted to use were a 1/2" thick, I had to make the table top in sections rather than in one piece. This made the main center section small enough that it would fit in my CNC where I could cut it out accurately. 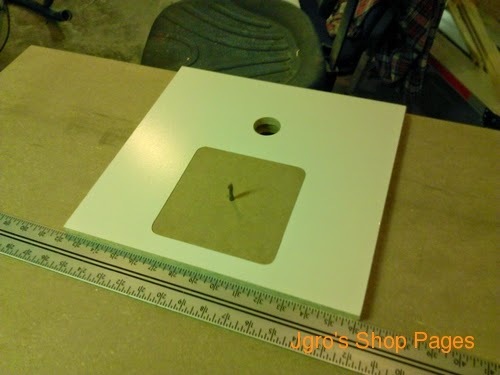 I then made a temporary insert plate out of MDF with a 1/4" hole machined exactly in the center. The image below shows how I located the main center section. I put a 1/4" bit in the router and raised it up. 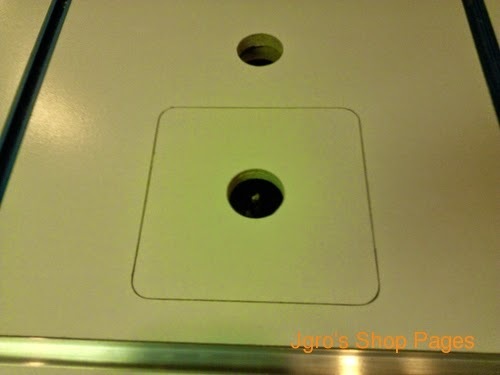 This located the insert plate at the center of the router. 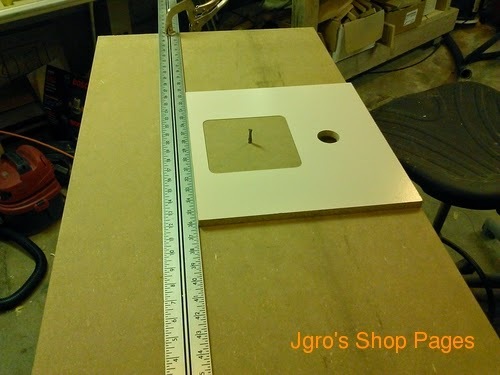 I then used a large t-square to get it square to the table and clamped it down. The particle board was laminated on both sides, so I decided to use contact cement to fasten the final table top to the MDF sub-surface. Below is the center section with glue on it waiting for it to set up. With the center section set, I put the t-tracks for the fence and the miter channel and glued down the rest of the table top. Here they are before being trimmed off. 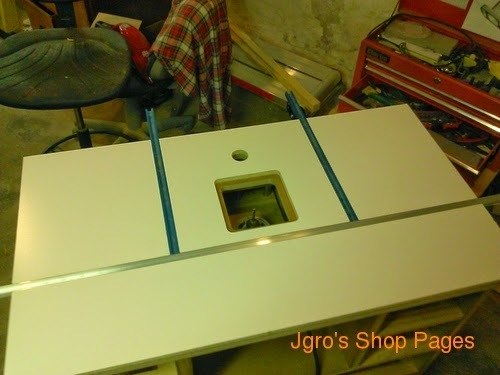 The miter channel is a piece of aluminum channel that I bought from Menards. 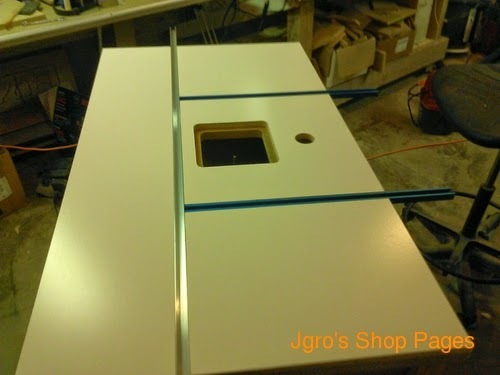 I think it is for edging plywood. I will have to make a custom miter gauge to fit the width of the channel, but oh well, it was cheap! I trimmed the t-track and miter channel and attached them and then cut another insert plate out of some left over particle board. I also trimmed out the sides with some oak.